I do have a problem with this function (Bump map), In fact nothing happen when I follow the tutorial here under. I do not have the same window appearing when I clic on Bump map. The tutorial is for Gimp 2.8 and you are on 2.10. Lots of change in the tools. Lighter areas to higher altitudes (bumps). If you have sharp level transitions, you get the equivalent of cliffs, while progressive blends create slow slopes. IIRC Gimp requires the two layers to have the same size. Everything else is just how the light simulates the relief. Since the bump-mapping creates shadows and lights, it works best on layers with an average luminosity (difficult to create shadows over pitch black...). 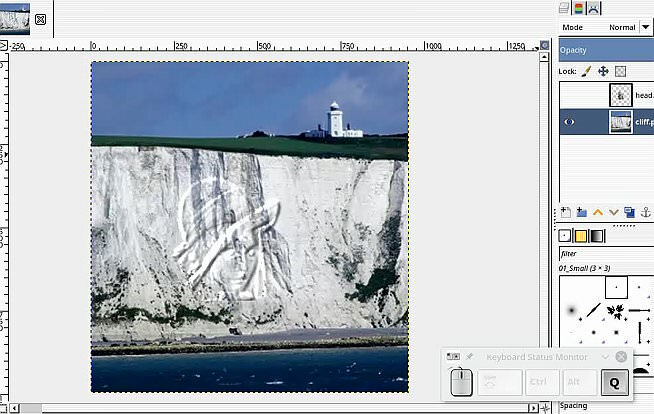 Bumpmapping with Gimp 2.10 is easier than with Gimp 2.8 The effect shows on the canvas instead of a small preview. Thank you both of you for reply and exemples.